Save $2,50 on a package of Flamingo Quisine General Tao chicken. Save $3 on Flamingo frozen poultry product. Coupon valid in ON only. 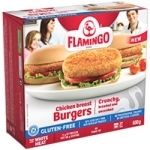 Save $1 on a package of Flamingo non-breaded chicken burgers. Get 2 Quisine Flamingo 600g for the price of 1. Save $3 on Flamingo frozen products. Save $3 on Flamingo Quisine Indian butter, Thaï or Mexicana Chicken 600g pack.